Posted July 31, 2017 by Andler Dental & filed under Cosmetic Dentistry, Preventive Dentistry, Restorative Dentistry. We all know that eating or drinking too much sugar can cause cavities, and by now we should all be aware of the oral health risks associated with smoking or tobacco use. But these common facts aren’t the only habits that may be affecting your smile. At our dental office in Madison, we know plenty of other habits that can be just as damaging. Check out some of the top, and perhaps surprising, culprits. Nail biting is an incredibly common habit that comes with its share of harmful side effects. Not only can biting your nail expose your body to the tons of bacteria that live under the nail, it can also cause damage to your jaw and smile. The act of nail biting cause the jaw to protrude at an unnatural angle, placing pressure on your jaw joint. If the habit continues, you could experience TMJ or TMD. What’s more, nails are made of a hard material and biting them off can cause teeth to chip or break. Ice cubes have one purpose and one purpose only — to make things cold. However, some individuals have a difficult time keeping themselves from chewing on these frozen cubes of water. Crunching on ice is a sure way to create tiny chips in the teeth, leaving them exposed to bacteria that cause cavities. Eating ice can also lead to bigger cracks or breaks that require cosmetic dentistry to fix. Exposing your teeth to lemons also exposes them to the high amount of acid found in these colorful fruits. Acid of any kind erodes the protective layer of tooth enamel. 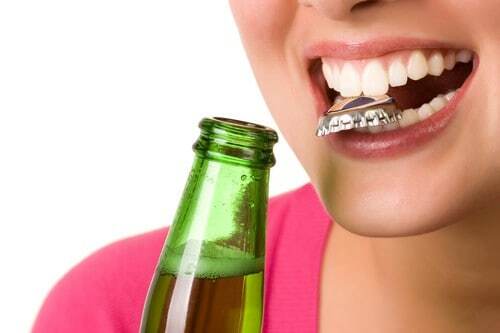 Once the enamel is gone, you may experience increased tooth sensitivity as well as an increased risk for decay. Your dentist in Madison encourages you to brush your teeth twice a day, but not just any type of brushing will do. Any scrubbing motion or using too much pressure can cause gums to recede. Instead, brush using gentle circles to get your smile clean and keep it protected. Some people find themselves clenching or grinding in moments of stress. Others do it while they’re sleeping and don’t even know it. Either way, there are various types of dental issues that can occur as a result including jaw pain (TMJ/TMD), worn down teeth, or broken teeth. We’ve all used our teeth to open pesky packaging or to hold something when our hands were full, however it’s really not recommended. Ripping open stubborn packages or using your teeth for anything other than eating can chip teeth or cause other damage. The team at our Madison dental office would prefer if all of our patients and neighbors had perfectly healthy smiles and never encountered any problems, which is why we put so much emphasis on preventing dental issues from ever occurring by educating them on things just like this. But we understand that things do happen, and when they do, we’re more than happy to help.